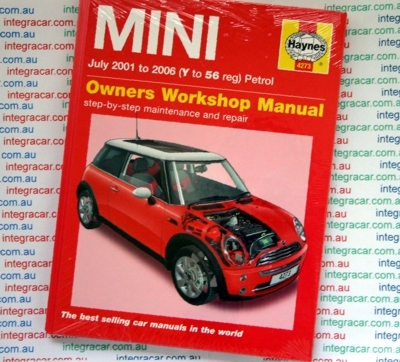 covers theMini One, Cooper & Cooper S Hatchback, including option packs, petrol models 2001 thru 2006 (Hardcover 224 pages). Does NOT cover models with CVT or Steptronic automatic transmission or features specific to Convertible or John Cooper 'Works' conversions. Does NOT cover new ('Mk II') MINI introduced August 2006. The Mini Hatch was designed by Frank Stephenson, and drew inspiration from the original Mini. The name of the new car's brand, MINI, was all-capitalised to distinguish it from its predecessor. Development of the car was conducted between 1995 and 2001 by Rover Group in Gaydon, United Kingdom and BMW AG in Munich, Germany. During this development phase, there was continual contention between the two design groups, especially concerning the positioning of the car; Rover wanted a straight economy car, whilst BMW supported a small, sporting car. Ultimately, BMW prevailed, and in 1999, they assumed control over the entire project following the departure of BMW's CEO, Bernd Pischetsrieder. When BMW divested itself of Rover in 2000, BMW elected to retain the Mini project, and to move the planned production site of the car from Rover's Longbridge plant, to BMW's Oxford plant in Cowley, Oxford, United Kingdom. The team of designers working on the 2001 Mini had finished the full-sized clay mock-up of the Mini in plenty of time for a presentation to the board of directors. However, the chief designer, Frank Stephenson, realised that the model did not have an exhaust pipe. His short-term solution was to pick up an empty beer can, punch a hole in it, strip off the paint and push it into the clay at the back of the car, which took just a few minutes. The overall design for the mock-up was so good that the board members told him not to change a thing, resulting in the distinctive exhaust tip seen in production cars. The vehicles produced during the 2001 to 2006 model years included four hatchback models (UK and some international markets: Hatch, US: Hardtop, other markets just plain Mini): the standard "Mini One", the diesel-engined "Mini One/D", the sportier "Mini Cooper" and the supercharged "Mini Cooper S"; in 2005, a convertible roof option was added to the Mk I line-up. In November 2006, BMW released a facelift version of the Mini Hardtop as a 2007 model-year vehicle. The first new generation Mini was introduced in 2001. In many European markets, the Mini One was powered by a 1.4 litre I4 version of the Tritec engine but all other petrol powered Minis used the 1.6 litre I4 version. Since 2005, a soft-top convertible option has been available across the entire range. There are numerous styling and badging differences between the models, perhaps the most obvious being that the Cooper S has a distinctive scoop cut into the bonnet. The Cooper S also has twin exhausts which exit under the centre of the rear valance. The (non-S) Cooper has more chrome parts than the Mini One and has a single exhaust. The Mini One D has no visible exhaust pipes at all. In some markets, such as Australia and the U.S., only the Mini Cooper and Cooper S are offered because the Mini One's engine was considered inadequate to deliver sufficient power to run an air conditioner — a necessary feature in those markets. [Almost fifty percent of all Minis sold in Australia and about seventy percent of those sold in the U.S. are the more-powerful Cooper S model. Other models of note, sold in varying markets around the world, are the Mini Seven, Mini Park Lane, Mini Check Mate, and Mini Monte Carlo. The names Cooper and Cooper S echo the names used for the sportier version of the classic Mini, which in turn come from the involvement of John Cooper and the Cooper Car Company. The Cooper heritage is further emphasised with the John Cooper Works (JCW) range of tuning options that are available with the Mini. John Cooper also created a one-off racing model of the Mini Cooper S named the Mini Cooper S Works. This car features many extras which help to improve performance, such as a racing exhaust and air filter as well as uprated suspension. The car also has one-of-a-kind 17-inch (430 mm) racing wheels. The Mk I Mini One, Cooper and Cooper S used some version of the reliable, Brazilian-built Tritec engine, co-developed by Chrysler & BMW; the Mini One D used a Toyota-built diesel engine. In August 2006, BMW announced that future engines would be built in the UK, making the car essentially British-built again; final assembly took place at Oxford, and the body pressings were made in nearby Swindon at BMW's Swindon Pressings Ltd subsidiary. All models used a transversely-mounted four-cylinder engine driving the front wheels. All four wheels are pushed to the corners of the body to improve handling. The styling of the car, like that of the Volkswagen's New Beetle, is a retro design that is deliberately reminiscent of the original Mini. The retro styling is further enhanced by retaining other classic Mini touches such as contrasting roof colours, optional bonnet stripes, optional rally lights, and black trim around the wheel arches and rocker panels that mimic the wide wheel flares found on many classic Minis. The Mini One and Mini Cooper were available with a ZF VT1F continuously variable transmission or with a conventional Midlands five-speed manual transmission (model years 2001-2004); the latter was replaced with a Getrag five-speed unit for the remainder of the Mk I production (2005–2006). The Cooper S came with a six-speed Getrag manual or (starting with the 2005 model year) a fully automatic transmission with paddle shifters. As standard, the Mini had a drive by wire electronic throttle, electronic brakeforce distribution, cornering brake control and electronic stability control (standard or optional, depending on model and region) to improve control and handling in adverse conditions.